Simon Pegg, Nick Frost and Edgar Wright’s Cornetto trilogy is awesome, if you don’t agree with me you’re a bad person and I don’t want to talk to you. 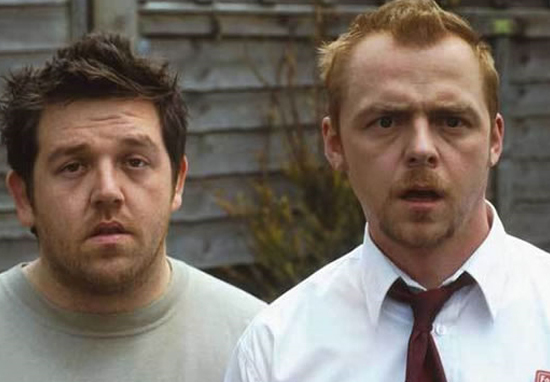 Whether it’s the cleverly written comedy or the deep underlying themes of each film, Shaun of the Dead, Hot Fuzz and The World’s End are classics in their own right, even better, none of these films required a pointless sequel to tarnish its legacy. However, Simon Pegg has toyed with the idea of a sequel to Hot Fuzz, my personal favourite out of the trilogy, and the idea for the plot sounds brilliant. Pegg was a guest on American talk show host, Larry King’s programme, to promote his latest film, Mission Impossible: Fallout. During their interview, King took a question from a fan who wanted to know, ‘which of the Cornetto trilogy would he like to make a sequel for?’. Because Hot Fuzz was about my character going to the countryside to be a cop in a small town, it would have to be about my character Nicholas Angel taking Nick Frost’s character Danny to the big city. Like Crocodile Dundee 2 was. If you haven’t seen Hot Fuzz yet, I suggest you stop what you’re doing (unless you’re in a life or death situation) and give it a watch. If you’re a fan of the 80s to mid-noughties action films like Point Break and Bad Boys II you’ve got to give this film a watch. It’s the perfect blend of comedy and pure unadulterated action. In January of this year, Pegg, and longtime collaborator, Nick Frost, confirmed they were working on an epic new horror-comedy TV show. The loveable duo – who’ve worked with each other since those classic Spaced and Shaun of the Dead days – will be teaming up for a new venture called Truth Seekers. Each episode will be thirty minutes long and they’ll all have their own individual paranormal incident which the show will focus on. Each episode is going to be an adventure, a potential haunting or something. It’ll start as a very parochial idea, a very small business venture for these people, but it will expand as the series goes on to be something far more global. Shaun of the Dead was a very parochial story set in North London and somehow it managed to get this global reach because everyone understands the language of zombie movies. A release date has yet to be confirmed for Truth Seekers and it’s unclear as to what kind of roles Pegg and Frost will have in the show. For all we know, they could just be a part of the behind-the-scenes creative team? But whatever happens, it’s good to see Pegg and Frost working together again, and I’m sure it’ll go down as another classic project in their incredible resumé. For now, you can catch Pegg in this summer’s action blockbuster Mission Impossible: Fallout, alongside Tom Cruise and Henry Cavill.